The leaders of the four main federal opposition parties met today with Prime Minister Justin Trudeau to discuss how to better support francophones outside of Quebec in the wake of cuts to French languages services in Ontario. The half-hour meeting — the first of its kind since Trudeau became prime minister — ended without delivering any concrete results, although those who attended the meeting said it was friendly, open and non-partisan. Getting the party leaders together is "a useful symbolic statement to governments that might not think that there is support right around the political spectrum for protecting the rights of both languages, and protecting the francophone minority in Ontario," Green Party Leader Elizabeth May said following the meeting. "Did anything new come out of it, any ground breaking news? No." In its fall economic update, Ontario Premier Doug Ford's government announced it would be cancelling a plan to build a long-awaited French-language university in Toronto and abolishing the position of the French language services commissioner. Last week, after widespread criticism, Ford backed down to a degree, sticking to his decision to cancel the French-language university but restoring the French language services commissioner's position under the province's ombudsman. He also named Attorney General Caroline Mulroney as a new minister of francophone affairs and said he would hire a senior policy adviser responsible for francophone affairs. Conservative Party Leader Andrew Scheer, who faced criticism for not immediately condemning the cuts or demanding that Ford reverse them, asked for the meeting Monday in a letter to Trudeau. According to a senior Conservative official speaking on background, Scheer suggested that an unused, federally owned building in Ontario could be re-purposed for the university if it goes ahead. 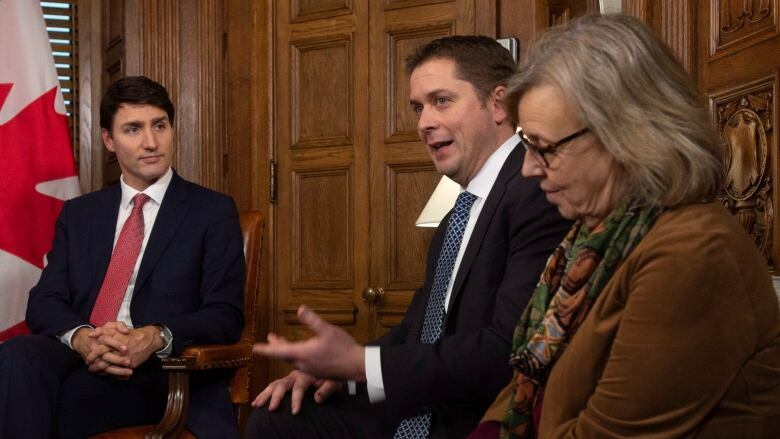 Scheer, who did not speak to reporters after the meeting, has said there's a limit to what he can do to pressure a provincial government on an issue that falls under its jurisdiction. May agreed that federal leaders' hands are tied to an extent. "When you're talking about what you do when you have a province that's doing things that are seriously eroding the protections of the rights of any population, if it's in provincial domain there is only so much the federal government can do," said May. "But they can increase the funding for programs within their jurisdiction." May also said that while the the party leaders expressed support for pushing ahead on building a French-language university, it can't happen without the province on board. NDP Leader Jagmeet Singh said the meeting was cordial and friendly and he was encouraged to see all the main federal party leaders on the same side of an issue. He added, however, that he was disappointed with the lack of hard results. "I wanted to see a concrete measure on the table to save this university in Toronto," he said. "There wasn't a concrete proposition. The government said that they would be open to investing and being partners but I think we need to actually propose something concrete to put more pressure on the provincial government." The meeting was also called to address the concerns of francophones in other provinces — including New Brunswick, Canada's only official bilingual province, where the new Progressive Conservative government has just one elected francophone member.